Shelley West Clark | Galion Inquirer Crestline sophomore AJ Watkins with the follow through after one of his three-point field goal attempts during Tuesday night's Division IV tourney opener against St. Paul. Watkins scored nine to lead the Bulldogs but it would be the Flyers coming out on top, ending Crestline's season; 60-45. Shelley West Clark | Galion Inquirer The Bulldogs' Kaden Ronk scores on a fast-break lay-up after his steal during Tuesday night's tourney action against the St. Paul Flyers. Ronk would score seven in the loss as the Flyers advance in the tournament by winning 60-45 over Crestline. 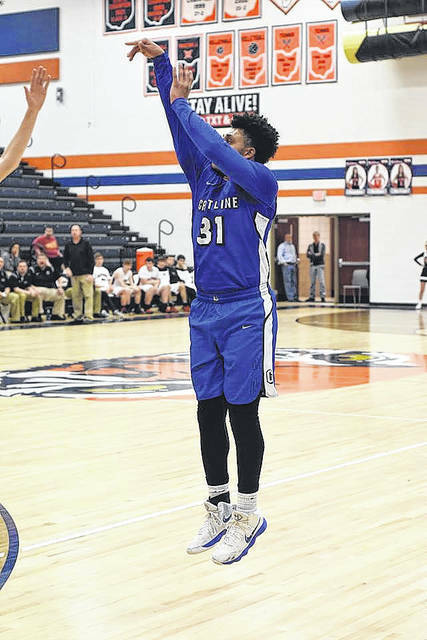 Shelley West Clark | Galion Inquirer The Crestline Bulldogs 2017-2018 boys hoops season came to an end at Galion High School on Tuesday evening. Crestline fell in their Division IV sectional semifinals contest to the Norwalk St. Paul Flyers by a final score of 60-45. GALION — The Crestline Bulldogs boys basketball team entered Tuesday evening’s Division IV Willard District sectional semifinals game with a full head of steam. Crestline finished off their 2017-2018 hoops campaign with a five-game winning streak and were looking to keep it going as the No. 9 seed in the tourney against the No. 6 seed, Norwalk St. Paul Flyers. Both squads took to the floor at Galion High School shortly after the No. 8 seed St. Mary Central Catholic defeated the No. 10 seed Buckeye Central Bucks; 58-32. With the Panthers advancing on to the sectional championship game against the No. 2 seed Colonel Crawford Eagles on Friday, the Bulldogs were looking to follow suit. Things started rocky for both squads on Tuesday, as jitters were apparent by the missed shot attempts and multiple turnovers occurring in the first few minutes of the opening quarter. Both the Flyers and the ‘Dogs would settle in and when the first eight minutes were complete, Crestline found themselves in a 17-10 hole. In the second frame, it was much the same story. Back and forth basketball and handsy defense became the name of the game to round out the first half and after 16 minutes in Galion it was the St. Paul Flyers leading the Crestline Bulldogs; 31-22. There were a combined 18 turnovers in the first half of play; 11 committed by the Bulldogs and seven by the Flyers. Scoring continued to be scarce to begin the second half and by the time the buzzer sounded, St. Paul had added 10 points and Crestline just eight as the Bulldogs season began to slip away, down 41-30 to start the final quarter. The scoring barrage that was the fourth quarter also went in favor of the Flyers as they would proceed to tack on an additional 19 points to secure the win; 60-45, as Crestline managed just 15 points, their highest quarter mark of the contest. AJ Watkins would finish as the leading scorer for the Bulldogs on the evening, coming off of the bench to hit 3/7 three-point attempts for the game for nine points. Davon Triplett finished with eight points for Crestline while also grabbing 13 rebounds. Kaden Ronk contributed seven points off of the bench for the ‘Dogs as well. 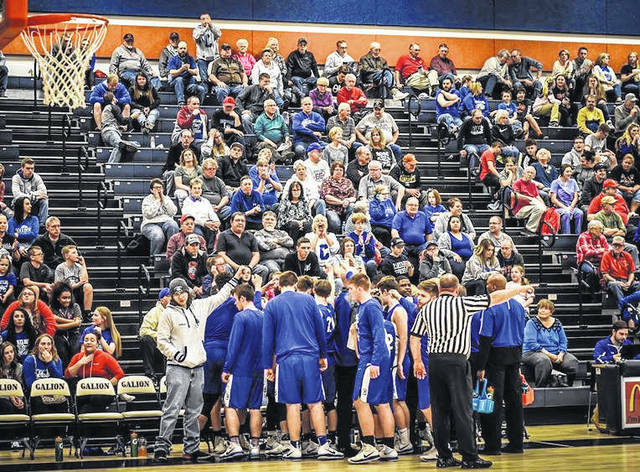 Other Crestline stats from Tuesday were: Team- 14/36 (39%) from the interior, 4/19 (21%) from the perimeter, 5/7 (72%) at the free-throw line, 31 total rebounds (11O, 20D), 7 assists, 10 steals, 6 blocks and 20 turnovers committed; Zach Gregory- 6 points, 4 rebounds, 2 assists; Gavin Balliett- 5 points, 2 rebounds; Ty Clark- 4 points, 4 rebounds, 1 block; Max Anatra- 4 points, 2 rebounds, 4 assists, 2 steals; Destin Chatman- 2 points, 2 rebounds; Kevin Winkler- 2 steals; Watkins- 1 rebound; Triplett- 1 assist, 2 steals, 2 blocks and Ronk- 1 rebound, 4 steals, 2 blocks. Jake Griffin led the way for St. Paul with 18 points, six rebounds, one assist and two steals on the night. Nate Winslow came off the bench for a dozen points, all in the first half of play. Chris Ruffing rounded out the double-figure scorers for the Flyers with 10 points, including a big, follow-up dunk on an offensive rebound. Ruffing also had 10 rebounds to complete the double-double, as well as two blocks and two steals. Other St. Paul stats from Tuesday were: Team- 18/42 (43%) from the inside, 5/14 (36%) from the outside, 9/18 (50%) at the line, 42 total rebounds (16O, 26D), 8 assists, 11 steals, 2 blocks and 17 turnovers committed; Nick Lukasko- 6 points, 7 rebounds, 2 assists, 1 steal; Ian Kashian- 5 points, 2 rebounds; Nick Winslow- 4 points, 2 rebounds, 1 assist, 2 steals; Paul Pearce- 3 points, 2 rebounds, 2 assists, 2 steals; Brandon Furlong- 2 points; Nate Winslow- 3 rebounds, 2 assists, 1 steal and Treg Smith- 2 rebounds, 1 steal. The Bulldogs season ends with an 11-12 mark, their best showing since the 2007 season. As for St. Paul, they now advance to play for a sectional title on Friday, March 2 at 8 p.m. against the No. 4 seed South Central Trojans. That contest will also be at Galion High School and will follow the Colonel Crawford/St. Mary Central Catholic contest. “There were expectations for this year for the team and for them to be that close to .500 speaks volumes,” says Crestline head coach Rob Lisle. “They went from one win two years ago to five wins last year and 11 this year and we will look to continue to improve. I like where the kids are at, where our program is at…baby steps,” Lisle concludes. 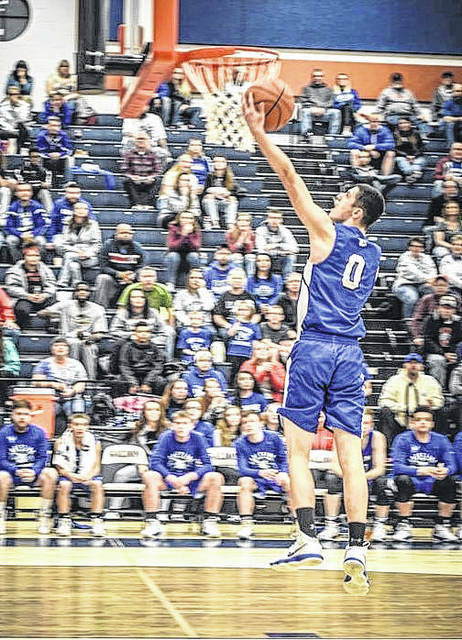 Crestline sophomore AJ Watkins with the follow through after one of his three-point field goal attempts during Tuesday night’s Division IV tourney opener against St. Paul. Watkins scored nine to lead the Bulldogs but it would be the Flyers coming out on top, ending Crestline’s season; 60-45. The Bulldogs’ Kaden Ronk scores on a fast-break lay-up after his steal during Tuesday night’s tourney action against the St. Paul Flyers. Ronk would score seven in the loss as the Flyers advance in the tournament by winning 60-45 over Crestline. The Crestline Bulldogs 2017-2018 boys hoops season came to an end at Galion High School on Tuesday evening. Crestline fell in their Division IV sectional semifinals contest to the Norwalk St. Paul Flyers by a final score of 60-45.